Hydraulic leaks discovered in October 2011 in underwater pipes in the Magic Reservoir dam led to threats from the Environmental Protection Agency, and now a lawsuit filed by Magic Reservoir Hydroelectric against the Big Wood Canal Co.
Magic Reservoir Hydroelectric, a wholly-owned subsidiary of J.R. Simplot Co., filed suit against the Big Wood Canal Co. on Oct. 23 in 5th District Court in Hailey to force the canal company to release enough water in the reservoir to complete “dry repairs” of the leaks. 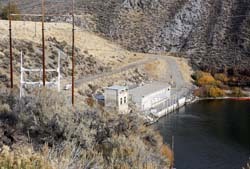 The hydroelectric company operates an electrical-generation facility at the dam at Magic Reservoir—in southern Blaine County—but the canal company controls the rate of water flows over the dam. According to court records, the hydroelectric company has disbursed money since 1986 to the Big Wood Canal Co. from proceeds gained from power generation at the dam. Reports indicate that the reservoir would be dropped by one-third of its volume, beginning October 29, with “a much larger release” of water beginning on Thursday, Nov. 1. The water would flow for 10 days down the Big Wood River channel north of Shoshone. The complaint states that the first hydraulic leak was discovered underwater at the dam on Oct. 11, 2011, and that scuba divers were unsuccessful at repairing it. When an apparent second leak was discovered, the EPA put the hydroelectric company on notice that fines of up to $32,500 per day could accrue until the leaks are fixed, or up to three times the costs incurred with cleaning the hydraulic oil from the water. The leaks are in the interior tunnel control gate on the dam. J.R. Simplot Energy Purchasing Director Don Sturtevant signed a court affidavit stating that there are “significant concerns” regarding the potential damage to the structural integrity of the dam if scuba divers continue attempts to engage in “blind excavations” in the wall of the dam in an attempt to locate the leak. The complaint filed by Magic Reservoir Hydroelectric states that Big Wood Canal Co. is in violation of an agreement to begin spilling water over the dam on Oct. 15 at the “fastest amount safely possible” to a level below the location of the leak to repair the leaks. Attorneys for the Big Wood Canal Co. did not return calls by press time Thursday.